At its height during the 1400s, the Incan empire was the largest in the world, stretching 2,500 miles north to south and supporting a population of more than ten million people. The temples, extensive roads, elaborate masonry, and treasures of gold and silver associated with the Incas date from around 1200 through the 1400s. The city of Cuzco became the powerful center of an empire that spread to encompass more than 100 small nations. Roads were built to criss-cross the entire empire, running through valleys and along the sides of mountains. The Incas never developed the wheel, but the roads provided the means to move large amounts of stone and goods used to build and sustain great cities. Trained runners were used to communicate messages throughout the empire. The Inca cultivated maize and potatoes, domesticated the llama as a beast of burden, crafted boats of balsa wood to travel on rivers and streams, and built suspension bridges of rope, among their many accomplishments. The empire was primarily expanded by three emperors, Pachacuti Inca Yupanqui and his descendants Topa Inca Yapanqui (ruled 1438–1471) and Huayna Capac (ruled 1493–1525). The latter's sudden death in 1525 came before he named a successor, and the nation became bitterly divided, a situation that still raged when the Spanish conquistador Francisco Pizarro (c. 1475–1541) and his army of about 400 men arrived in 1532. Lured by vast amounts of gold they found in Inca cities, the conquistadors kidnapped an Inca leader and held him for ransom. The ransom, estimated at about $50 million in gold and silver, was paid, but the leader was executed anyway. Diseases such as smallpox, previously unknown in the New World, had begun spreading as early as the 1520s. The combination of disease, estimated to have killed two-thirds of the Incan population, and military reinforcements from Spain after Pizarro showed off the great treasures he had found, allowed the Spaniards to subdue the Incan empire, systematically sweeping through and plundering all the great Incan centers. They missed one, however, and it would remain lost to the world until 1912. The majestic site is called Machu Picchu, a city in the clouds that rests at 8,000 feet in altitude between two mountains, Huayana Picchu ("young mountain") and Machu Picchu ("ancient mountain"), and overlooks a sacred river and valley called Urubamba. research in Peru, was alerted by a local farmer, Melchior Artega, about ancient ruins high up in the mountains. 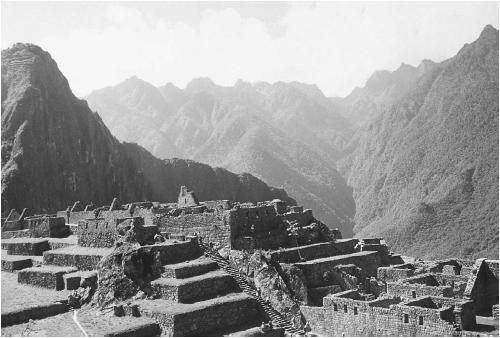 Bingham followed the lead and rediscovered the site of Machu Picchu. He publicized his findings in 1912, and in April of 1913 National Geographic magazine devoted an entire issue to the site. Even though many mysteries abound about Machu Picchu, what has been discovered about the site since 1911 has led some to call it "the eighth wonder of the ancient world." Machu Picchu features religious shrines and temples, baths and water systems, plazas, fountains, and elaborate masonry work. Stones are fitted so tightly in structures that they have withstood almost five hundred years of weathering and the lush growth of vegetation. Machu Picchu, situated on a long, narrow strip between mountains and above a valley, has a series of open plazas, and was divided into three sections— agricultural, urban, and religious. The agricultural section comprises a series of terraces bordered with irrigation channels. Crops were cultivated on levels above the channels to avoid erosion. The farm area is dotted with small buildings believed to be lookout huts. The urban area is on the part of the ridge that descends abruptly into the valley. A 67-step staircase rises up from the valley to the largest urban sector. Most of the structures have one room with solid walls of intricately fitted stones. The finest structures are believed to have housed high-ranking teachers. Many of the walls have niches the size of adult humans sculpted into them; the purpose of the niches is unknown. A plaza with a large rock in the center separates the urban and religious areas. Among the structures in the religious center is the Intihuantana Shrine, a temple carved from granite. The temple is considered a shrine to sun and stone, both of which were worshipped by Incas, and is also believed to have served as an astronomical observatory. Some of the buildings in the religious center are three-walled structures, including what is called the Great Central Temple and the Temple of the Three Windows. The latter building is believed to be associated with an Incan legend that their original ancestors emerged from a cave that had three windows. Also located in the religious center is the Temple of the Sun, a circular tower believed to have an astronomical orientation. The most accepted view of Machu Picchu portrays it as a religious sanctuary serving high priests and "virgins of the sun." More than 80 percent of the graves found on the site contain the bones of females, considered to have been "chosen women." Machu Picchu was thought to have been visited by selected members of Incan royalty who were transported along special roads that could only be used with their permission. Since the roads were seldom used, few Inca knew about them. The conquistadors never found the way, nor did they find Incas who could lead them to the site. The reason why Machu Picchu was abandoned remains a secret lost to time. ——. Flights into Yesterday: The Story of Aerial Photography. New York: St. Martin's Press, 1969.